This 2-Post Sliding Rack Kit helps you reduce the time required to properly install Dell components into 2-post racks. It combines structural integrity with ease of use. This product has been tested and validated on Dell systems to ensure it will work with your Dell PowerEdge Server 2650 and PowerVault 775N. 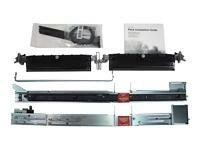 This product includes the following parts: Rack Mounting Kit and Installation Guide.